Some of the biggest backups were in Georgia , where the governor’s race was among the nation’s most-watched midterm contests and was generating heavy turnout. One voter in Gwinnett County, Ontaria Woods, waited more than three hours and said she saw about two dozen people who had come to vote leave because of the lines. The good-government group Common Cause blamed high turnout combined with too few voting machines, ballots and workers. Fulton County elections director Richard Barron acknowledged that some precincts did have lines of voters but said that was due to the length of the ballots and voting machines taken from use because of an ongoing lawsuit, although plaintiffs in the case dispute that as a reason. While voting went on without a hitch in many communities, voters from New York to Arizona faced long lines and malfunctioning equipment. By Tuesday afternoon, the nonpartisan Election Protection hotline had received about 17,500 calls from voters reporting problems at their polling places. Kristen Clarke, president of the Lawyers’ Committee for Civil Rights Under Law, which helps run the hotline, said that number was well ahead of the last midterm election in 2014, when it had received about 10,400 calls by the same time. Tuesday’s election marked the first nationwide voting since Russia targeted state election systems in the 2016 presidential race. Federal, state and local officials have been working to make the nation’s myriad election systems more secure. There were no signs throughout the day that Russia or any other foreign actor had tried to launch cyberattacks against voting systems in any state, federal authorities said. There was also no indication that any systems have been compromised that would prevent voting, change vote counts or disrupt the ability to tally votes, U.S. officials said. That was little comfort to voters who found themselves waiting in long lines or dealing with malfunctioning voting equipment. 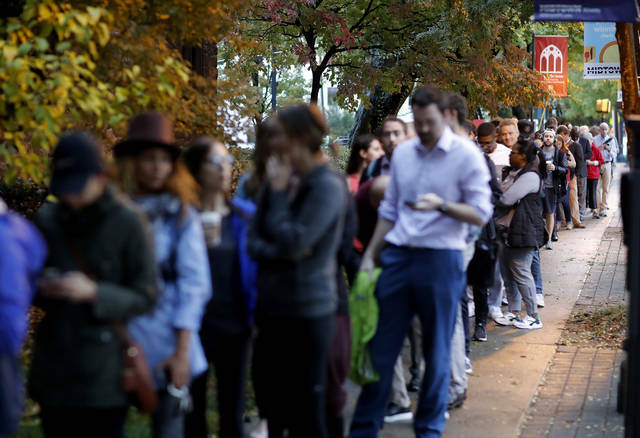 Across New York City, reports of broken ballot scanners surfaced at several polling places. 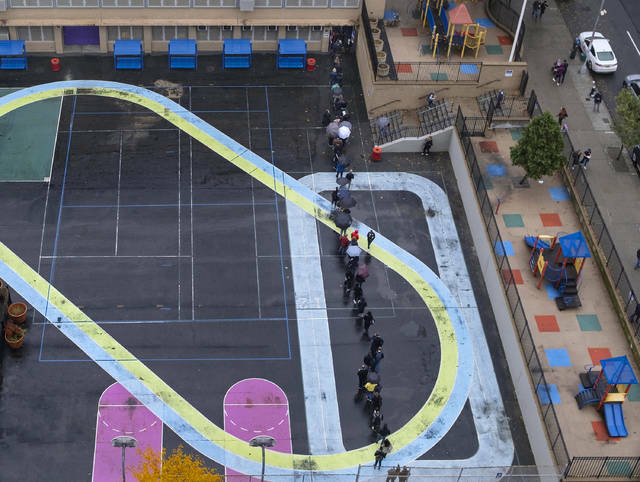 Turnout was so heavy at one packed precinct on Manhattan’s Upper West Side that the line to scan ballots stretched around a junior high school gym. Poll workers there told voters that two of the roughly half-dozen scanners were malfunctioning and repairs were underway. 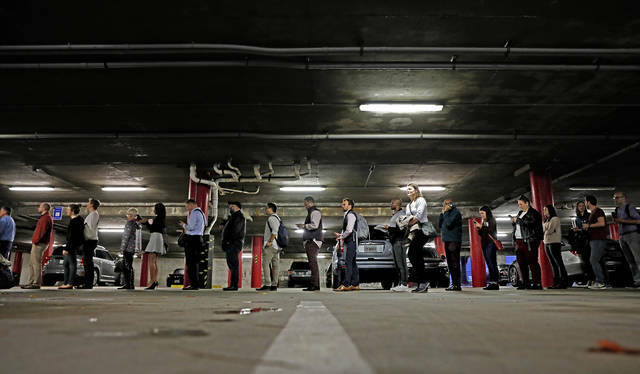 Voters arriving at two polling stations discovered that most scanners had broken down, forcing some people to drop their ballots in emergency ballot boxes or vote using affidavit ballots. “There are broken scanners everywhere in Brooklyn,” said Stefan Ringel, spokesman for Brooklyn Borough President Eric Adams. Ringel said Adams and his staff were being flooded with phone calls, emails and text messages reporting breakdowns in more than a dozen neighborhoods. Many voters nevertheless stuck it out, determined to cast their ballots. “People are grumpy and frustrated but positive in a weird way, making jokes and talking to one another. I think it’s because we all are in the ‘no one will stop our vote today’ mood,” said Nikki Euell, an advertising producer who waited more than two hours to vote in Brooklyn’s Greenpoint neighborhood. More than 40 states use computerized voting machines that are more than a decade old or are no longer manufactured. Elsewhere, polling place confusion caused problems for voters and poll workers. In Phoenix, a polling site was foreclosed on overnight, forcing poll workers to move it just in time for polls to open. For about an hour after polls opened, a Sarasota County, Florida, precinct had to tell voters to come back later because their ballots were unavailable. In one Indiana county, voting was snarled for hours because of what election officials said were computer problems checking in voters, while in another part of the state a judge ordered 12 polling places to stay open late after voting didn’t start as scheduled. In Texas, home of a hotly contested U.S. Senate race, delays were reported in Houston after apparent issues with registration check-in machines at some polling places. Later in the day, a judge ruled that nine Houston-area polling places would stay open beyond the usual closing time after advocacy groups complained that they didn’t open on time and forced many voters to leave without casting ballots. And in El Paso, the U.S. Border Patrol canceled a crowd control exercise that was scheduled for Tuesday, following criticism from civil liberties groups that it could dissuade people from voting.